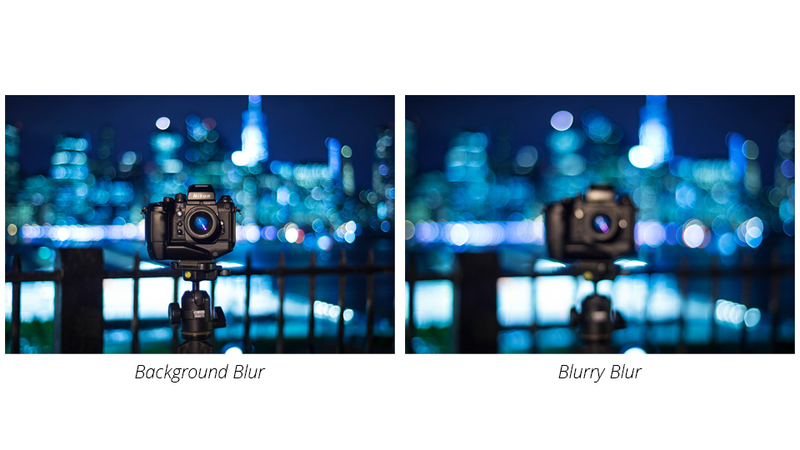 There are several myths and misconceptions surrounding Depth of Field. In Part I, we looked at the basics of DOF. 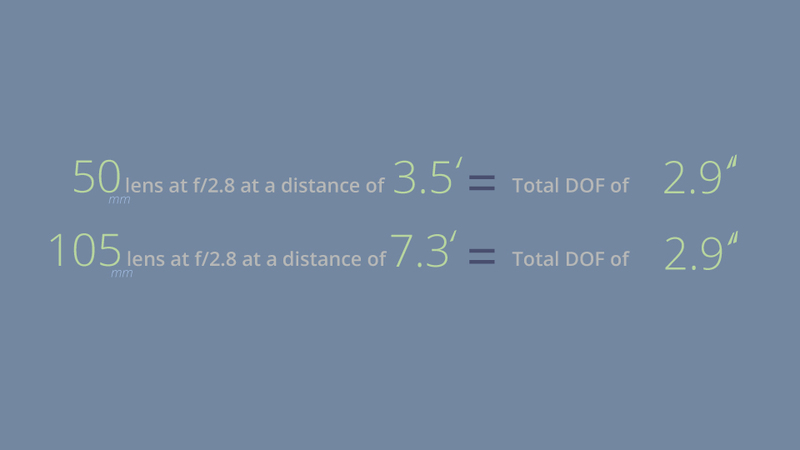 Part II got into the math behind how to calculate DOF. Here, in Part III, I hope to dispel and/or explain these myths and misconceptions. If you are reading about photography on the Internet, you have undoubtedly heard about bokeh (a seemingly hot topic these days), so you might think that DOF and background blur are related. They are not. Well, not exactly related. Let us set up a camera on a tripod at a fixed distance from a subject. We can turn the focus ring of the lens to bring that subject into sharp focus. If we keep turning the focus ring, or turn it back from whence we came, the image will become increasingly blurry. This is because the plane of focus is moving farther and farther from the subject. To increase the blurriness, we focus farther and farther from the subject. We may have increased the attractive background blur, but we also made our subject into a blurry blob. Art? Sure. But, let’s assume we want to be able to identify the subject in this particular photo. Changing focus and, therefore, focus distance for a subject at a defined distance is not really an adjustment of DOF. Technically, we did shift the DOF because we changed the focus distance, but we lost our subject into the blur. In reality, DOF simply tells the photographer at what distances before and aft of the focus distance that blurriness will occur. It does not specify how blurry or what “quality” those areas will be. The design of the lens, the design of the diaphragm, and your background define the characteristics of the blur—its intensity, texture, and quality. In two images with similar DOF and different focal lengths, like what we discussed above, the areas outside of the DOF look different due to the magnification of the blurry spots caused by the different focal lengths, but the blur is almost identical—the blur spots in the greater focal length image are magnified, but similar in relative size and shape. So, the farther out of focus an object is, the blurrier it becomes. However, when changing focal length and focus distance, the blurriness outside of the DOF range is relatively consistent. It all comes back to variations of COC! Before I dive in to this mini-topic, know that I am trying to illuminate a phenomenon for illustrative purposes to explain how DOF works and changes. There is a lot of “noise” online touching on this subject, so again, I will try to clear up some of the confusion. There are articles on the Web and in books that attempt to illustrate how DOF changes when you use different lenses (or zoom to different focal lengths) while keeping your subject at relatively the same size. However, it is unlikely that, as a photographer, you will find yourself trying to maintain a relative subject size in different frames with different lenses. After all, the reason you change lenses, move closer or farther from your subject, or zoom in or out, is usually to change the size of your subject relative to the frame or background. Right? One of the dangers of getting buried in the math of DOF is that the photographer might lose sight of what the real goal of a photograph is, as well as lens field of view and how perspective changes with different focal length lenses. If you find yourself tinkering with DOF with two different lenses while trying to maintain a consistent subject-to-frame size and you are not writing an article on DOF, you might want to pause and think about why you are doing this! As the formula for DOF states clearly above, the longer the focal length of your lens is, the shorter the DOF. But, let us not forget there are other factors affecting DOF, especially focus distance. So, I am going to use an online DOF calculator to speed up my math and throw a few scenarios at you. After you see the numbers, I will explain the practical application of this. We head out with our trusty full-frame DSLR camera to take a portrait of an older camera (don't laugh). Traveling light, we pack only a 50mm f/1.8 and 105mm f/2.8 lens. Our goal: a nice shot with an out-of-focus background (more on background blur in the next section) with short DOF, so we will shoot with the lenses at f/2.8. Crunch the numbers. If we stand 3.5' away from our subject, and photograph the camera with the 50mm and 105mm lenses at f/2.8, we can calculate the DOF to be the following. As you can see, the shorter focal length lens produces much longer DOF. However, we want the subject to fill, but not dominate, the frame. At 3.5' with the 50mm lens, our subject provides us with a nice composition. To do this with the 105mm lens, we need to move to a distance probably around 7.3' to get the same relative subject size. Whoa. So, because we opened the distance, the DOF of the 105mm lens at 7.3' is identical to that of the 50mm lens at 3.5'. Different lenses, same aperture, identical DOFs because our focus distance has changed. But, and there is always a but, if you look at the two images above, they look different, even though the subject size is the same and the depth of field is nearly identical. The image with the 105mm lens has a softer background, the background coverage is narrower, and the background is compressed, whereas the 50mm lens has given us a slightly clearer background, covering more of the background landscape. Why? Lens field of view. The 105mm lens magnifies the narrower field of view and also magnifies the out-of-focus areas more than the 50mm lens that shows a wider field of view and less magnification of the out-of-focus regions. When I say, “magnifies the out-of-focus areas,” think back to the COC discussion we had above. Even though the background is relatively the same distance away, we are magnifying those blurry spots with the longer focal length lens. The point of this part of the discussion is that the field of view of your chosen lens or focal length is a good thing to keep in mind when you are trying to capture a subject in a certain way. This is another subject of much debate and there is a lot of noise out there on this topic. I will admit, my understanding of DOF has increased exponentially as I have been writing these three articles, but research into this part of the subject has been a challenge. 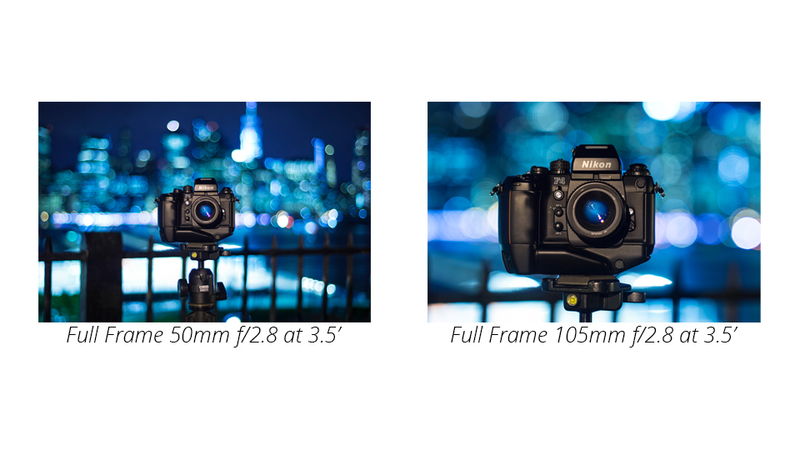 One of the popular arguments in favor of full-frame format cameras over smaller sensors is shorter DOF. I have a brochure from a major camera manufacturer on my desk that markets the short DOF potential of the full-frame sensor in a manner that makes you think the smaller sensors from the same manufacturer are incapable of producing short DOF images. I even make mention of DOF in my discussion about the pros and cons of the different sensor formats. 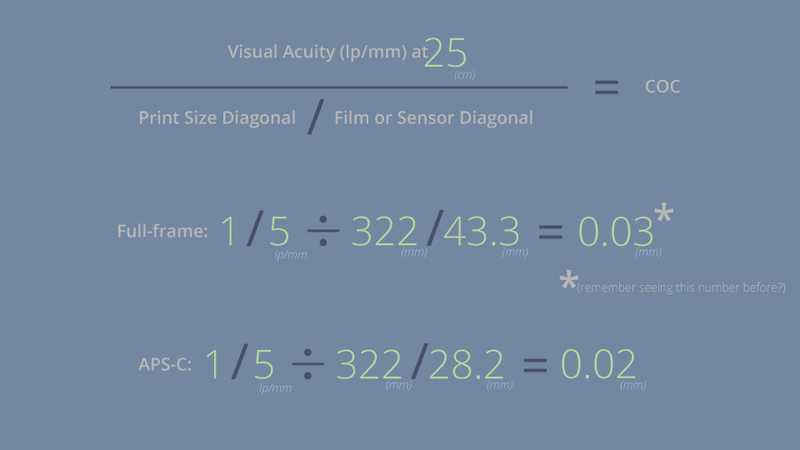 So, does the size of the sensor or format of the film change your DOF? Yes. But, it probably does not change the DOF in the manner you may think it does. 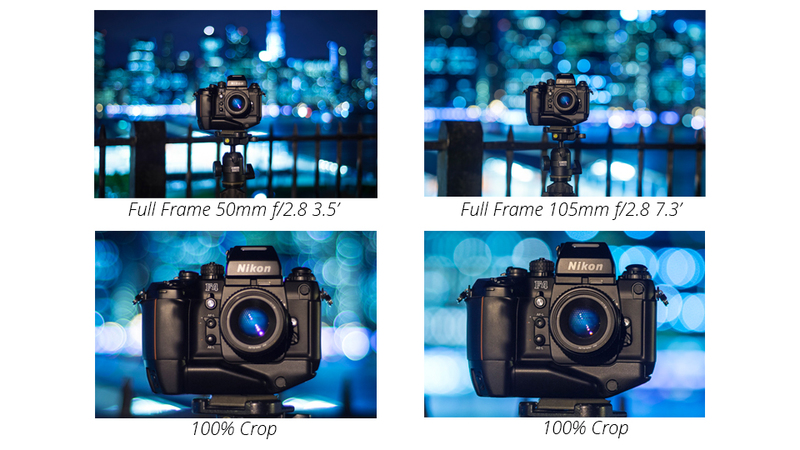 Many think that the “crop factor” of the smaller sensor is the culprit, as it changes the effective focal length of the lens. Well, that is only true if you plug the 35mm equivalent focal length into your calculations in place of the actual lens focal length. But, the focal length of the lens is a physical distance and did not change, only the field of view changed. Also, the aperture of the lens is unchanged as it is unrelated to the size of the sensor. So, let’s forget the crop factor and 35mm equivalent for now and let’s certainly forget talking about applying crop factor to your aperture! If you read back through these articles, you will see a handful of formulas, but none of them has a variable that is designated “format size.” Check your notes, if you must. But, I just said that format size does affect DOF. If sensor size does not appear anywhere in the formula, how does it alter the DOF? Enlargement factor: Remember our discussion about COC? One of the variables in that formula is for “enlargement factor.” I also mentioned the “standard” for COC was an image produced at 8x10" from a 35mm frame viewed at 25cm. A full-frame sensor measures 24 x 36mm and must be multiplied approximately 7x to get to 8x10". The APS-C sensor (1.5x smaller) measures 16 x 24mm. 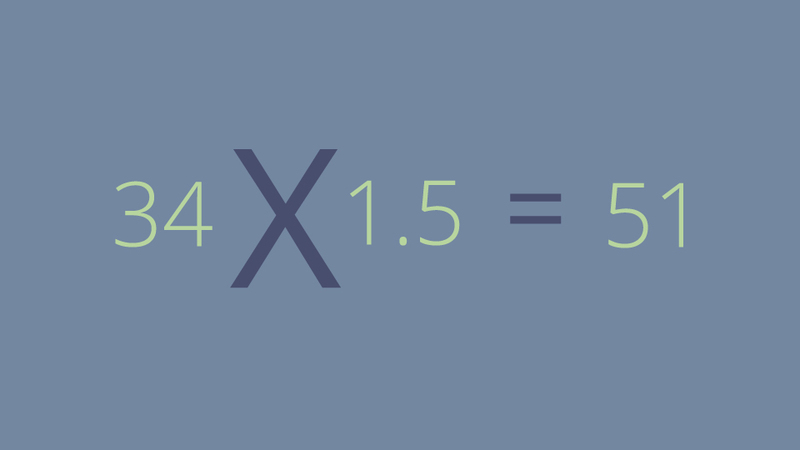 To get to 8x10" you need to multiply that sensor by approximately 12x. So, the smaller sensor changed our COC by 1/100 of a millimeter. Let us plug that into a hyperfocal calculation for our trusty 50mm f/1.8 lens at f/8. Wow! A tiny change in COC gives us a hyperfocal shift that looks way more substantial than 1/100 of a millimeter, right? 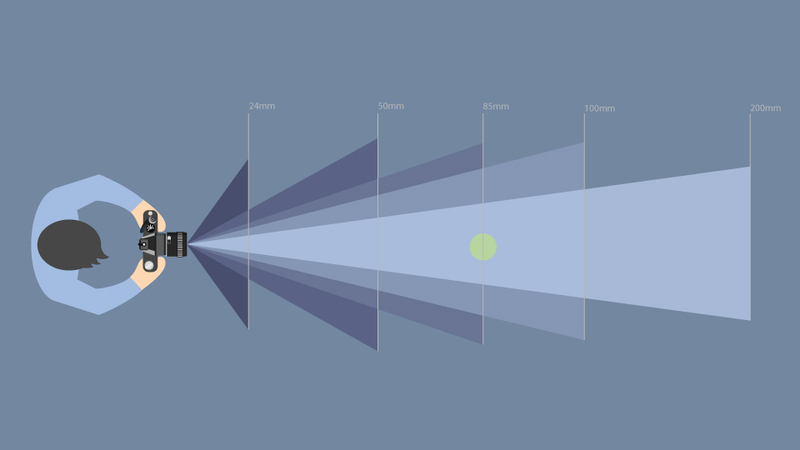 This means that at f/8, the hyperfocal range on a full-frame camera with a 50mm lens set to f/8 starts at 17', whereas the APC-C camera’s hyperfocal distance starts at around 25'. Ready for this trick? 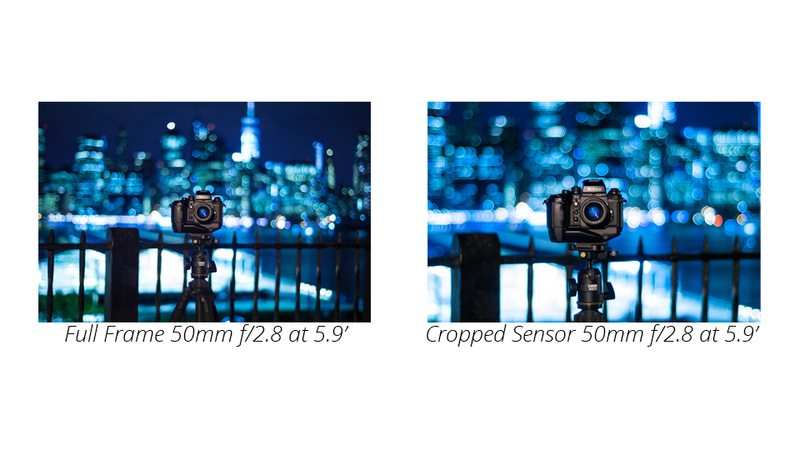 We mentioned that the APS-C sensor is 1.5x smaller than the full-frame sensor. Look at the hyperfocal numbers above. 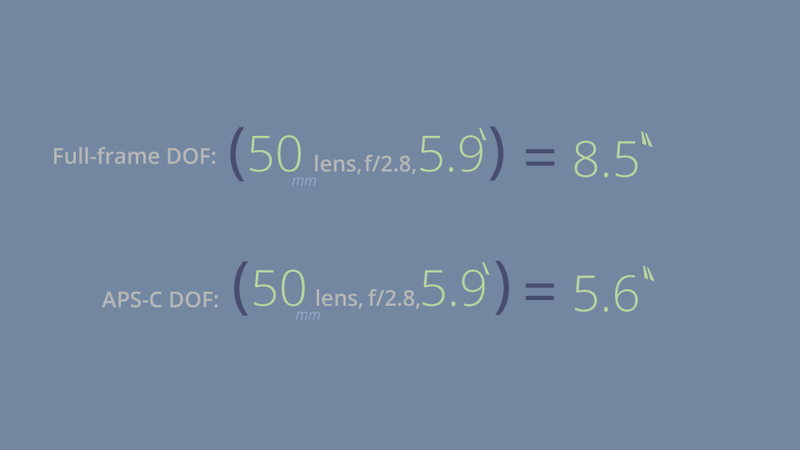 You can use the “crop factor” number to convert a full-frame hyperfocal distance of a lens to an accurate distance for the same lens on your APS-C camera by multiplying the full-frame hyperfocal distance by 1.5 or (1.6 for Canon). If your lens has hyperfocal markings on the barrel, remember that they will likely be calibrated for a full-frame sensor or 35mm film, so, if using an APS-C or Micro Four Thirds camera, multiply the distance by the crop factor. So, at 5.9' and an aperture of f/2.8, there is a 2.9" difference in the total DOF for the two different sensors (almost 1.5" on the near and far side). 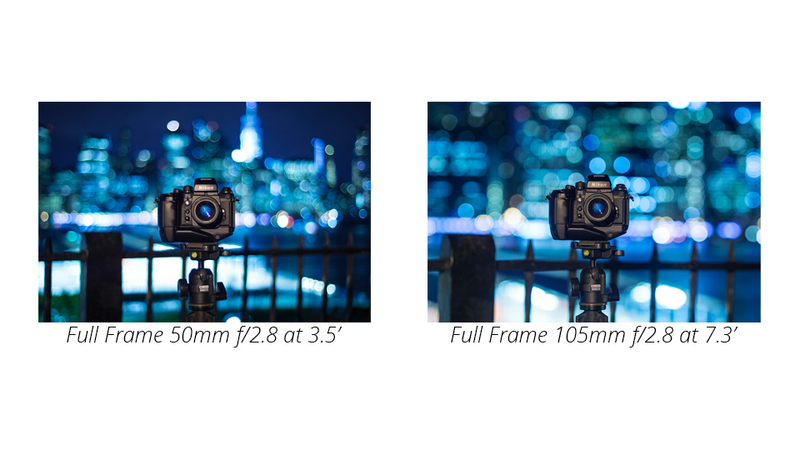 The APS-C camera has a shorter DOF when using the same lens at the same aperture and distance. But, don’t the full-frame pundits often extol the virtues of the shorter DOF on the larger format sensors? Subject-to-lens / focal distance: If we want the subject to be the same size in the full-frame image and the APS-C image, we have to change our distance from the subject. As you know, this changes your DOF calculation. We have a full-frame and an APS-C camera. Both have 50mm lenses set at f/2.8. We want to take portraits with the subject filling the frames identically. Let's leave the full-frame camera at 5.9' and move the APS-C camera back to 6.3'. 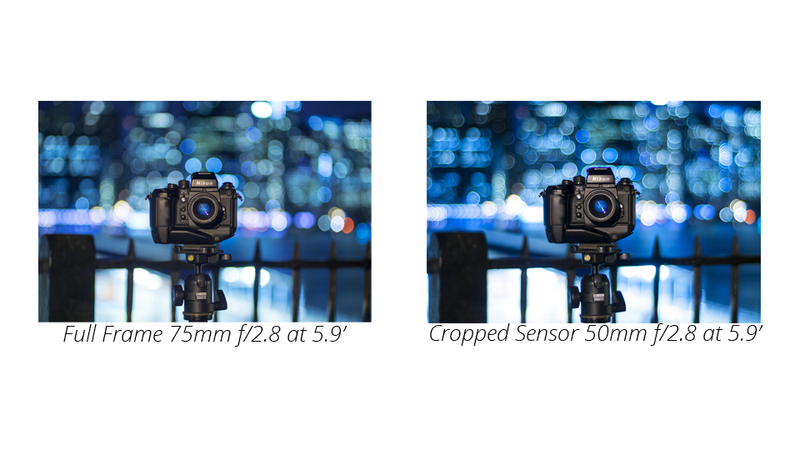 Crunch the numbers and the full-frame sensor still has a longer DOF than the APS-C sensor when capturing a subject with similar perspective using the same lens at different distances. So, again, why do full-frame sensors claim to have a shorter DOF? What about changing lenses to achieve the same subject perspective? Let’s crunch those numbers by attaching a 75mm lens to the full-frame camera, leaving the 50mm lens on the APS-C camera, and setting them both at 5.9' and f/2.8. Boom! There it is the full-frame camera has a shorter DOF in this scenario where we have maintained the same perspective on the subject while taking photos at the same distance with two different lenses. How much shorter? 1.9" in this scenario. Does any of that really matter? Here is the bottom line: unless you are shooting both a full-frame camera and an APS-C camera at the same time, using the same focal length lens and same aperture, or changing lenses and/or distances to keep your subject the same size for images from each camera, this does not have much bearing on the photo you are taking unless you are trying to make a comparison of two cameras taking one image. The DOF for your particular lens/camera combination is what it is. Some photographers may prefer a longer DOF for a given lens; others may prefer a shorter DOF. It is really up to you and what you are trying to achieve with your photography. Depending on your artistic vision, one format might not be advantageous over the others. Besides that, this is really confusing. Is it not? Yikes. My hair hurts. Are you still reading? Did you survive all three parts of the DOF discussion? Congratulations! DOF is a key element in photography of all kinds. It is sometimes not well understood, but knowing how to adjust and utilize your DOF can definitely help you make your images stand out and help you achieve your artistic vision. If you missed any of this series and need to start at the beginning, click here to read Part I. However, if you feel a strong desire to twist your brain into a pretzel with the math, click here to read Part II. There are a great many articles on DOF online. I sometimes find mistakes or conflicting information in the articles. What you have read above has been carefully researched and is the best information I feel that I can present. However, if you have a question, comment, or see something that you feel is inaccurate; please bring it to my attention in the Comments section, below. Thanks for reading! I'm writing a article about DoF on my language now and its totally based on this article. I was wondering if I can use (with proper credits of.course) the pictures u used in this article. Can I? Thanks for finding the article and basing yours on mine! I hope my information is correct! We spoke offline regarding image usage...so I think you should be good-to-go! Thank you very much for this artikel! I have always wonderd why my old zeiss lens gave a different dof stuck on my fuji 1,5x crop than on my full frame Canon. It made no sens to me why a smaller crop of the same projected image would have a different dof, but your maths explains it to me. I am glad you found the article helpful! Yep, slightly different DOF, but the overall feel of the bokeh should remain pretty much the same! It may be easier to anticipate Depth of Field from just 2 factors: aperture and magnification. (This assumes a typical Circle of Confusion and same size image sensor.) If you think about it, distance from the subject and focal length ultimately effect image magnification. For example, if you place a 50 mm lens and a 100 mm lens at such distances that the image sizes in the viewfinder are equal, you'll find equal depth of field (given qual aperture settings). I've not confirmed this mathematically, but it appears to be so. 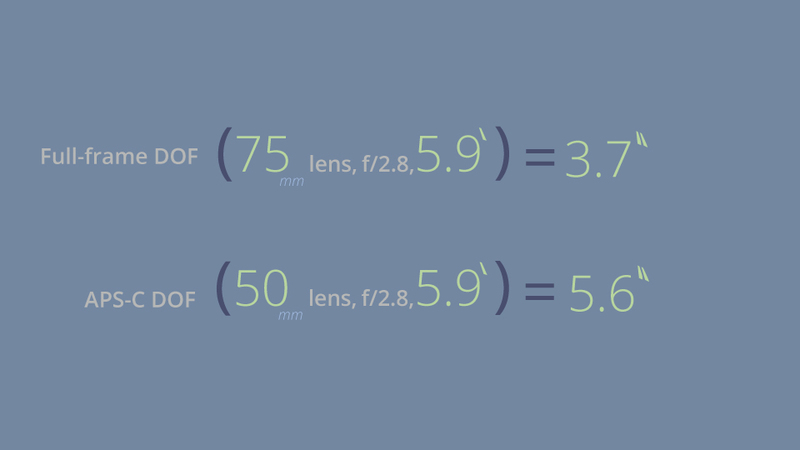 When someone pointed this out, a cleared up my confusion over the interaction of focal length and subject distance regarding how things will look in the final image. Re sensor size, have you tried photographing the same subject with point-and-shoot (small sensor) and full frame cameras where the subject size in the viewfinders is equal? Perhaps placing the subject in the middle of a length of picket fence so the resulting depth of field from both images would be quite obvious. This is a topic of interest as I may sell my full frame Canon 5D in favor of an Olympus M10 four-thirds sensor. I get wonderfully soft backgrounds from the Canon when doing macro and portrait. I'm wondering if backgrounds look as good from a four-thirds sensor. So why am I changing? Smaller size, less weight, fewer lenses, much easier to carry on the airlines. This depth of field topic will be important in downsizing to smaller sensor mirrorless cameras. DOF is one of those areas of photography, like sensors, ISO, and others, where it is super easy to get lost in the numbers and noise and forget about how the image actually looks. Its all mathematical, yes, but, in reality, the photo is the only thing that matters! Above are some comparisons of APS-C to full-frame. I have not tried full-frame against a point-and-shoot or another small sensor camera for an article. That might be a good idea, if I can get my boss to aquire all the gear. Looks pretty shallow to me! Like I said, the final image is what matters! Enjoy the mirrorless experience! You'll love the smaller size and lighter weight! So a full frame in the last scenario (with lenses you mentioned) would be harder to get proper focus because of the shorter depth of field? If camera was identical except for sensor size. Good question. I do not know if it would be "harder" to focus, but, with a shallower depth of field (on any camera), precision (or "critical") focus is more...critical. Basically, the more razor-thin the depth of field (the shorter the DOF), the more precise you need to be with your focus. You can easily imagine a scenario where you are shooting a portrait and the camera focuses on the tip of the subject's nose and, because the DOF is so shallow, the eyes are out of focus. A longer DOF would be much more forgiving. Thanks for the question! Let me know if you have any follow-ups! Sorry but increasing focal length does not decrease DoF it only magnifies the blur in the background. I have to disagree the first part of your statement. 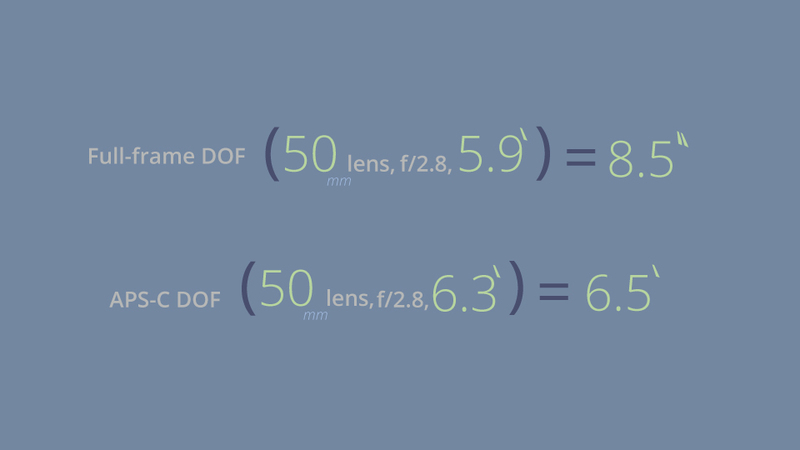 According to the formulas used to calculate DoF, increasing focal length does indeed decrease DoF. For the second part of your statement, I agree. From the article: "In two images with similar DOF and different focal lengths, like what we discussed above, the areas outside of the DOF look different due to the magnification of the blurry spots caused by the different focal lengths, but the blur is almost identical—the blur spots in the greater focal length image are magnified, but similar in relative size and shape." Fantastic articles. Nice work. Regarding the discussion of whether or not sensor size affects DOF... I'd love to see a comparison between a full-frame 35mm camera + normal lens (50mm) and an 8×10 large format camera + normal lens (technically 325mm but I don't think that exists so just use a 300). Keep the subject distance the same so that the field of view is comparable. Same aperture, of course. Use 5.6 instead of 2.8 because LF lenses pretty much never go as large as 2.8. The DOF of the 8×10 camera can be insanely shallow. People will argue with me until they're blue in the face that the "sensor size" makes no difference. Then they see the ground glass and all arguments magically end. Feel free to conduct the test and send us the results! Sensor size does make a difference, but, in my opinion, when talking about the differences in full-frame, APS-C, and MFT, I do not think it is always as apparent as people are led to believe. I have gotten some very shallow DOF images with MFT cameras that leave nothing to be desired on that front. Thanks for sharing! Thanks for the compliments and thanks for reading! Wow, great 3 articles about Depth of Field. I've been a Focus Puller on TV shows and Feature films for 25 years and could not have done a better job explaining it. I will disagree with one thing you said above (section on Lens Field of Vew and DOF), well partly disagree. You state "There are articles on the Web and in books that attempt to illustrate how DOF changes when you use different lenses (or zoom to different focal lengths) while keeping your subject at relatively the same size. Fact: your DOF does change." Then you have a chart that shows 2 different lens focal lengths at 2 distances to keep the subject the same relative size with the same DOF. These 2 items conterdict each other. I agree with the chart and not the statement "Fact: your DOF does change." I have had several instances where I've been asked to use a wider lens and get closer to the subject to increase the DOF. The DOF does not change when doing this, as your chart shows (or if it does, it's not noticeable). The second misnomer I get asked often is when we are filming in a format other than 35mm, say 16mm film (yes I'm old) or even a 2/3 inch video camera where we are using a 75mm lens, for example, "what is that lens in 35mm?" It's a 75mm, is my answer. People somehow believe that the format changes the focal lenght of the lens! A 75mm lens is a 75mm lens regardless of the format or sensor size! I think you did a pretty good job explaining this but I think it's a question that still comes up often. Please keep up the good work! First of all, thanks for the compliment and the comments. Great catch! I'll tweak the article to remove the "Fact:" line. 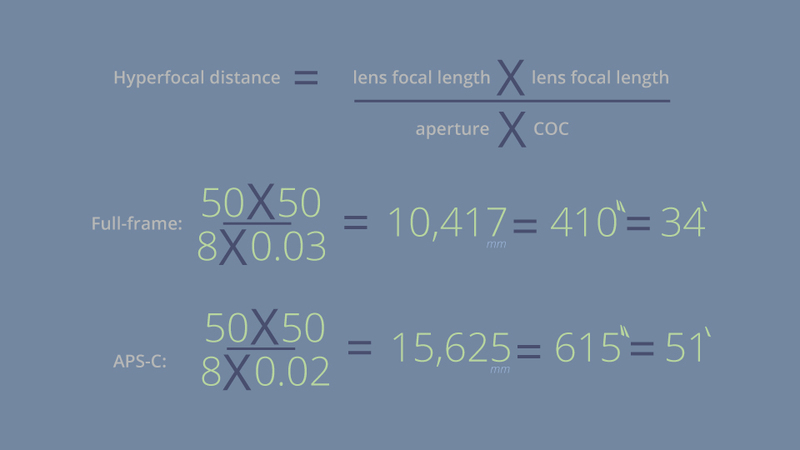 Regarding lens focal length...I feel your pain. Check out my focal length article and have it handy if you get tired of explaining yourself! Thanks so much for reading and sharing your insight!